The FBI and the U.S. 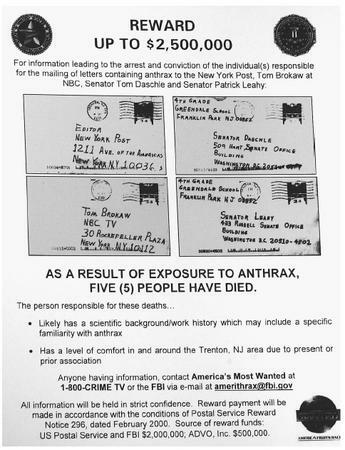 Postal Service released this reward flyer for information leading to the arrest and conviction of the individuals responsible for mailing anthrax-tainted letters in 2001 to members of Congress and the media. Although anthrax is a relatively new weapon in the hands of modern potential bioterrorists, the threat of death from the inhalation of spores has been part of human history since antiquity. Some scholars argue that anthrax is the sooty "morain" in the Bible's Book of Exodus, and is likely the "burning wind of plague" that begins Homer's Iliad . Another feature of anthrax that has led to its exploitation by terrorists is the physiology of the bacterium. Bacillus anthracis can live as a "vegetative cell," growing and dividing in a rapid and cyclical fashion. The bacterium can also form a metabolically near-dormant form known as a spore. An individual spore is much smaller and lighter than the growing bacterium. The spores can drift on air currents, to be inhaled into the lungs. Once in the lungs, the spores can resuscitate into an actively growing and dividing bacterium. The infections that are collectively termed anthrax can result. Although millions of spores can be released from a few grams (fractions of an ounce) of Bacillus anthracis , only about 5,000 to 8,000 spores are sufficient to cause the lung infection when they are inhaled. If left untreated or not promptly treated with the proper antibiotics (such as Cipro), the lung infection is almost always fatal. Non-inhalation contact with Bacillus anthracis can result in cutaneous anthrax—a condition more treatable with conventional antibiotic therapy. An often-overlooked aspect of the use of anthrax as a terrorist weapon is the economic hardship that the dispersal of a small amount of the spores would exact. A report from the Centers for Disease Control and Prevention, entitled The Economic Impact of a Bioterrorist Attack , estimated the costs of dealing with an anthrax incident at a minimum of U.S. $26 billion per 100,000 people. In just a few months in 2001 alone, a flurry of anthrax incidents, most of which turned out to be hoaxes, cost the United States government millions of dollars.